Pelikan’s convention of choosing descriptive model numbers has, in general, been one that is easy to follow. A fair bit of information is conveyed with just a single letter and a few numbers. A ‘P’ indicates a cartridge pen whereas an ‘M’ denotes a fountain pen. The first number in the model is the series number indicating models of roughly the same size and style. If the model number ends in a ‘5,’ the pen has rhodium trim and if it ends in a ‘0,’ this usually, but not always, indicates gold-colored furniture. This code, while simplistic, is overall well thought out and effective. How then do we explain a pen that defies these conventions? In a previous post I addressed the case of the M201, a clear demonstrator which turned out to be an M2oo is all respects, just made in a limited run for the Japanese market. I also discussed the M150/481 which has proven very confusing to collectors over the years as it combines numbers from two separate models, a short-lived convention used in the mid-80’s. With these precedents in place, it should come as no surprise then that you can regularly find pens for sale in certain markets branded with the designation M151. 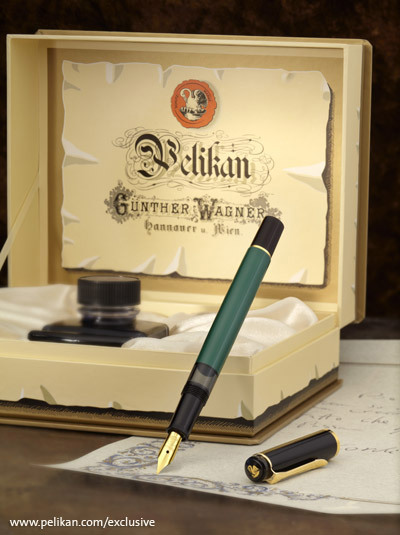 If you own one of these, rest assured that it is a legitimately produced model from Pelikan (link is in Italian). Where does the M151 moniker come from and why does it look exactly like the M150? One would think that this might be yet another special edition, a pen to be sought out and collected separately from the other models in the M1xx series. The truth of the matter is nothing quite so exotic. Found predominantly for sale in the Italian market, the M151 is nothing more than an M150, identical in all aspects. These are found in the post-’97 trim (crown cap top, straight cap band, and trim ring at the piston knob) with a green barrel and a black cap & section. They appear to be sold as a reissued special edition with special packaging under a tag line that reads, “Everything passes…myths remain.” According to one of Pelikan’s European sales & marketing representatives, M151 is the company’s own “internal description” for the M150 model and is the name that the pen has come to be sold under in certain export markets. The model is usually packaged in a nostalgic gift box (depicted above) with a bottle of Pelikan 4001 Royal Blue ink. A matching K151 ballpoint pen is also available. Thanks Joshua! As a pre-1997 M150 owner it was interesting to see what other versions of the pen are like. The pre-’97 pens had a different look than the other classic lines due to that beveled cap band. The trim change really brought the M150/151 in line with the other models of the classic series. I never even heard of the 151, or I forgot. Thanks for these details. You’re welcome. A neat little piece of Pelikan trivia. Can the nib in this model be removed out for cleaning, as in other Pelikan models? The nib is absolutely revovable, just like the rest of the pens in the series, to facilitate swapping and cleaning. I hope that helps. Thank You very much. Very kind of you. Thanks for getting in touch. Check your email for a reply.